A naval division is a subdivision of a squadron or flotilla. It can also be a sub-division of a fleet. A flotilla, or naval flotilla, is a formation of small warships that may be part of a larger fleet. A flotilla is usually composed of a homogeneous group of the same class of warship, such as frigates, destroyers, torpedo boats, submarines, gunboats, or minesweepers. Groups of larger warships are usually called squadrons, but similar units of non-capital ships may be called squadrons in some instances, and flotillas in others. Formations including more than one capital ships, e.g. men-of-war, battleships, and aircraft carriers, typically alongside smaller ships and support craft, are typically called fleets, each portion led by a capital ship being a squadron or task force. A squadron, or naval squadron, is a significant group of warships which is nonetheless considered too small to be designated a fleet. A squadron is typically a part of a fleet. Between different navies there are no clear defining parameters to distinguish a squadron from a fleet, and the size and strength of a naval squadron varies greatly according to the country and time period. Groups of small warships, or small groups of major warships, might instead be designated flotillas by some navies according to their terminology. Since the size of a naval squadron varies greatly, the rank associated with command of a squadron also varies greatly. In administrative/functional sub-unit usage, unit size varies widely, though typically divisions number far fewer than 100 people and are roughly equivalent in function and organizational hierarchy/command relationship to a platoon or flight [ citation needed ]. A flight is a military unit in an air force, naval air service, or army air corps. It is usually composed of three to six aircraft, with their aircrews and ground staff; or, in the case of a non-flying ground flight, no aircraft and a roughly equivalent number of support personnel. 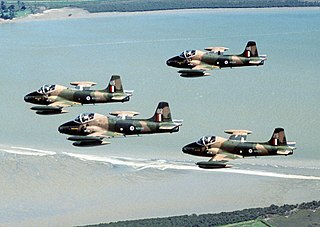 In most usages, multiple flights make up a squadron. The "flight" is also a basic unit for intercontinental ballistic missiles. Foreign languages equivalents include escadrille (French), escuadrilla (Spanish), esquadrilha (Portuguese) and Schwarm (German). In the West, the first general to think of organising an army into smaller combined-arms units was Maurice de Saxe (d. 1750), Marshal General of France, in his book Mes Rêveries . He died at the age of 54, without having implemented his idea. Victor-François de Broglie put the ideas into practice. He conducted successful practical experiments of the divisional system in the Seven Years' War. Maurice, Count of Saxony was a German soldier and officer of the Army of the Holy Roman Empire, the Imperial Army, and at last in French service who became a Marshal and later also Marshal General of France. He is best known for his decisive victory at the Battle of Fontenoy and is honored in the Walhalla memorial. Marshal General of France, originally "Marshal General of the King's camps and armies", was a title given to signify that the recipient had authority over all of the French armies, in the days when a Marshal of France usually governed only one army. This dignity was bestowed only on Marshals of France, usually when the dignity of Constable of France was unavailable or, after 1626, suppressed. Victor François de Broglie, 2nd duc de Broglie was a French aristocrat and soldier and a marshal of France. He served with his father, François-Marie, 1st duc de Broglie, at Parma and Guastalla, and in 1734 obtained a colonelcy. Lazare Nicolas Marguerite, Count Carnot was a French mathematician, physicist and politician. He was known as the Organizer of Victory in the French Revolutionary Wars and Napoleonic Wars. The Committee of Public Safety, created in April 1793 by the National Convention and then restructured in July 1793, formed the de facto executive government in France during the Reign of Terror (1793–1794), a stage of the French Revolution. The Committee of Public Safety succeeded the previous Committee of General Defence and assumed its role of protecting the newly established republic against foreign attacks and internal rebellion. As a wartime measure, the Committee—composed at first of nine and later of twelve members—was given broad supervisory powers over military, judicial and legislative efforts. It was formed as an administrative body to supervise and expedite the work of the executive bodies of the Convention and of the government ministers appointed by the Convention. As the Committee tried to meet the dangers of a coalition of European nations and counter-revolutionary forces within the country, it became more and more powerful. A notable change to divisional structures during the war was completion of the shift from square divisions (composed of two brigades each with two regiments) to triangular divisions (comprised of three regiments with no brigade level) that many European nations started using in World War I. This was done to increase flexibility and pare down chain of command overhead. The triangular division allowed the tactic of "two forward, one back", where two of the division's regiments would be engaging the enemy with one regiment in reserve. Infantry division refers to a military formation composed primarily of infantry units, also supported by units from other combat arms. In the Soviet Union and Russia, an infantry division is often referred to as a Rifle Division. A Motorised Infantry division refers to a division with a majority of infantry subunits transported on soft-skinned motor vehicles. A Mechanized Infantry division refers to a division with a majority of infantry subunits transported on armored personnel carriers (APCs) or infantry fighting vehicles (IFVs) or both, or even some other class of armored fighting vehicles designed for the transportation of infantry. Mechanized Infantry divisions in Nazi Germany were called Panzergrenadier Divisions . In Russia they were known as Motor Rifle Divisions. Infantry divisions were also expected to travel by foot from place to place, with transport vehicles or pack horses used to augment their travel. Divisions evolved over the course of time, for instance in 1944 Nazi Germany designated some of their infantry formations as Volksgrenadier Divisions , which were slightly smaller than the regular divisions, with wider issue of sub-machine guns, automatic and anti-tank weapons to reflect the reality that they were to be used in defensive warfare. In 1945, Nazi Germany seconded members of the Kriegsmarine to create Naval Divisions, which were of lower quality that the infantry divisions of the Army. They also created Luftwaffe Field Divisions from members of the Luftwaffe. Italian Mountain divisions are called Alpini Divisions . 1st Canadian Division , headquarters is located in Kingston. 2nd Canadian Division , headquarters is located in Montreal. 3rd Canadian Division , headquarters is located in Edmonton. 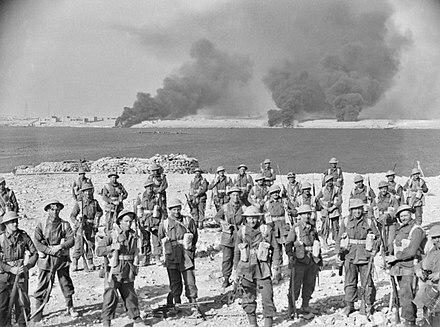 4th Canadian Division , headquarters is located in Toronto. 5th Canadian Division , headquarters is located in Halifax. 1st Division , in Nerima. 2nd Division , in Asahikawa. 3rd Division , in Itami. 4th Division , in Kasuga. 6th Division , in Higashine. 8th Division , in Kumamoto. 9th Division , in Aomori. 10th Division , in Nagoya. In the Soviet Armed Forces, a division (Russian : diviziya, дивизия) may have referred to a formation in any of the Armed Services, and included subunits appropriate to the service such as regiments and battalions, squadrons or naval vessels. Almost all divisions irrespective of the service had the 3+1+1 structure of major sub-units, which were usually regiments. In Imperial Russia, infantry formations were designated as (Russian : pekhoty); in English, "infantry". But on 11 October 1918 all such formations in the new Red Army were re-designated as "rifle" (Russian : strelkovaya). This was deliberately chosen as a means of breaking with the Imperial past, while also giving these troops a sense of being an elite; in the Imperial Army the riflemen had been the best of the foot soldiers outside the Guards. The new designation also hearkened back to the Streltsy of the 16th to early 18th Centuries, which were also elite troops. 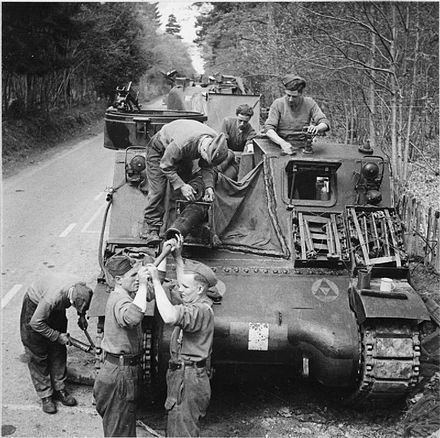 Before the Second World War, besides the Mechanised Corps, there were independent tank battalions within rifle divisions. These were meant to reinforce rifle units for the purpose of breaching enemy defences. They had to act in cooperation with the infantry without breaking away from it and were called tanks for immediate infantry support (Russian : tanki neposredstvennoy podderzhki pekhoty). ↑ House, Jonathan M. (30 December 2009). "Toward Combined Arms Warfare: a Survey of 20th-Century Tactics, Doctrine, and Organization". U.S. Army Command and General Staff College. Archived from the original on 30 December 2009. ↑ "1st Division". Australian Army. Archived from the original on 15 June 2013. Retrieved 4 June 2013. 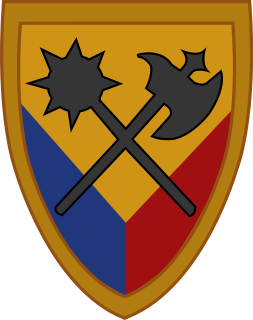 The 3rd Infantry Division is a combined arms and light infantry division of the United States Army based at Fort Stewart, Georgia. It is a direct subordinate unit of the XVIII Airborne Corps and U.S. Army Forces Command. Its current organization includes one Infantry and two armored brigade combat teams, one aviation brigade, a division artillery and support elements. The division has a distinguished history, having seen active service in both World War I and World War II. 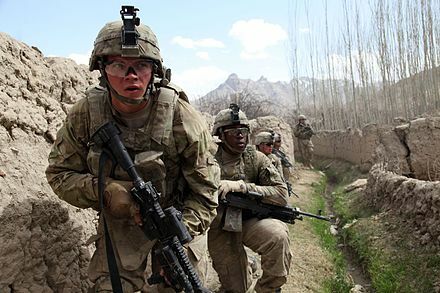 The 2nd Infantry Division is a formation of the United States Army. Its current primary mission is the defense of South Korea in the initial stages of an invasion from North Korea until other American units can arrive. There are approximately 17,000 soldiers in the 2nd Infantry Division, with 10,000 of them stationed in South Korea, accounting for about 35% of the United States Forces Korea personnel. The 2nd Armored Division was an armored division of the United States Army. The division played an important role during World War II in the invasions of North Africa and Sicily and the liberation of France, Belgium, and the Netherlands and the invasion of Germany. During the Cold War, the division was primarily based at Fort Hood, Texas, and had a reinforced brigade forward stationed in Garstedt, West Germany. After participation in the Persian Gulf War, the division was inactivated in 1995. Its units were later transferred to the 4th Infantry Division. 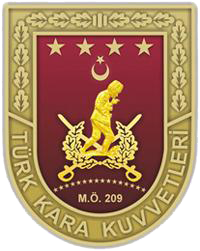 The Turkish Land Forces, or Turkish Army, is the main branch of the Turkish Armed Forces responsible for land-based military operations. Official sources trace the army's foundation to Modu Chanyu of the Xiongnu Empire in 209 BC, but the modern history of the army began with its formation after the collapse of the Ottoman Empire. 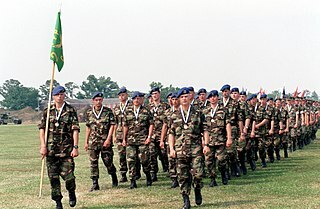 Significant events since the foundation of the army include combat in the Korean War and in the 1974 Turkish invasion of Cyprus, and acting as a NATO bulwark along Cold War frontiers through 1992. The army holds the preeminent place within the armed forces. It is customary for the Chief of the General Staff of the Republic of Turkey to have been the Commander of the Turkish Land Forces prior to his appointment as Turkey's senior ranking officer. Alongside the other two armed services, the Turkish Army has frequently intervened in Turkish politics, which has now been regulated to an extent with the reform of the National Security Council. The current commander of the Turkish Land Forces is General Yaşar Güler. The 12th Cavalry is a cavalry regiment of the United States Army. Reconnaissance, surveillance, and target acquisition (RSTA), is a type of unit in the United States Army. RSTA units are small reconnaissance units based on cavalry squadrons, and act at the squadron (battalion) level as a brigade reconnaissance team for the regiment (brigade). A regimental combat team (RCT) is a provisional major infantry unit of the United States Marine Corps to the present day and of the United States Army during World War II and the Korean War. 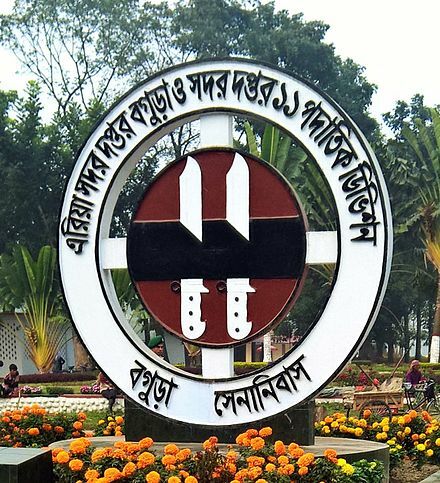 It is formed by augmenting a regular infantry regiment with smaller tank, artillery, combat engineer, mechanized, cavalry, reconnaissance, signal corps, air defense, quartermaster, military police, medical, and other support units to enable it to be a self-supporting organization in the combat field. The 194th Armored Brigade is a separate brigade of the US Army. The 3rd Brigade Combat Team, 1st Cavalry Division is a combined arms armored brigade of the 1st Cavalry Division. Its major equipment includes M1A2SEP Tanks, M2A3 & M3A3 Bradley infantry fighting vehicles, M109A6 Paladin howitzers, and M1114 up-armored Humvees. A Combat Command was a combined-arms military organization of comparable size to a brigade or regiment employed by armored forces of the United States Army from 1942 until 1963. 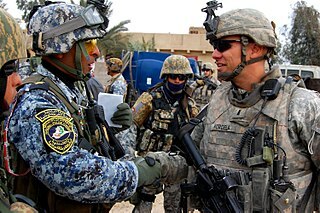 The structure of combat commands was task-organized and so the forces assigned to a combat command often varied from mission to mission. 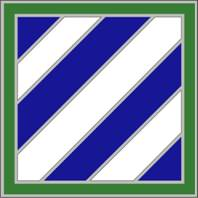 The U.S. 41st Infantry Regiment is a regiment of the United States Army. Its 1st Battalion is currently assigned to the 2nd Infantry Brigade Combat Team, 4th Infantry Division. Its 3rd Battalion is assigned to the 1st Stryker Brigade Combat Team, 1st Armored Division. The Granatieri di Sardegna Mechanized Brigade is a mechanized infantry brigade of the Italian Army, based mainly in Rome and central Italy. The brigade fields one of the oldest regiments of the Army and is one of the guard regiments of the Italian president. The name of the unit dates back to the Kingdom of Sardinia and not the eponymous Mediterranean island of Sardinia. The 2nd Kostrad Infantry Division abbreviated "Divif 2/Kostrad", is an army strategic command division of the Indonesian Army. The divisional commander is a two-star Major General. The division's headquarters are in Malang. The Infantry Branch is a branch of the United States Army first established in 1775. The Folgore Mechanized Division was a mechanized division of the Italian Army. Its core units were three mechanized brigades. The brigades headquarters was in the city of Treviso. Wikimedia Commons has media related to Division insignia of the United States Army .